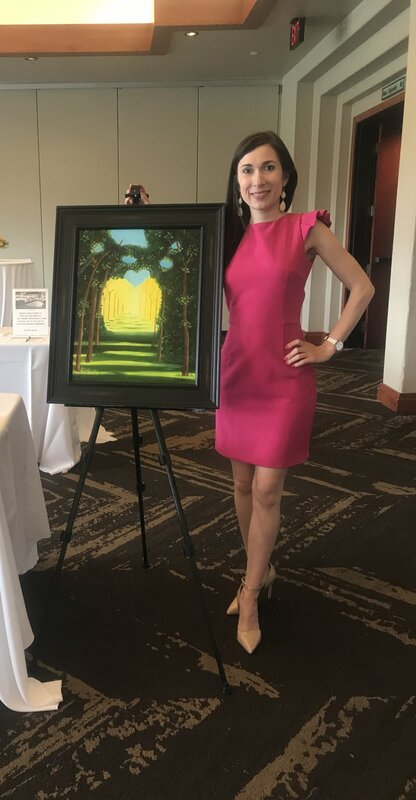 Ylenia Mino is an international Fine Artist, Art Advisor, contributing artist and council member of the Chuck Jones Center for Creativity, Guest Speaker at Radio's and Local TVs, Board member of the Art committee for the LA5 Rotary. Ylenia Mino was born at the foot of the Italian Alps in the small town of Ivrea in 1987. Since when Ylenia was little, she has had a significant interest in art. Every spare moment she had was dedicated to drawing or painting. In March 2011 Ylenia debuted as a solo artist at the International Artexpo, New York. In the following years she exhibited world-wide in such places as Austria, London, Italy, Los Angeles, Canary Islands, New York, Ohio, Boston, Martha's Vineyard, and many more. She collaborates with art galleries, advise for art fairs, schools, universities, and the famous Chuck Jones Center for Creativity. Ylenia has been interviewed for several radio and TV shows. Her paintings have also been featured in many newspapers as well as in magazines, such as i-Italy, Descubra New York, the New York Optimist Magazine, Southern Sass Magazine, the British art magazine Aesthetica, and City to Country Magazine. Her paintings have won competitions. Ylenia travels all around the world to show her creations. Currently she is based in Los Angeles, CA. In all her paintings there is a story. Many of her paintings evoke wonder and joy and a generally very optimistic attitude toward life. Her desire as an artist is to provide pieces of sky, nature that people can take home and continue to enjoy the peace emanating from them. Ylenia has been painting for over 24 years and her dream is to exhibit in all countries of the world. Because she believes in helping, encouraging and supporting people, Ylenia supports different charities, fundraising, and causes. Ylenia hopes this support will help to improve life conditions, give people a chance to develop their full potential and to reach their destiny in their society. As well, she desires that the creativity inside each person would be set free while she teaches painting classes and art workshops.